The Big Hurrah Gourmet Fruit Basket is a riot of color and good taste. This Deluxe Good Cheer Fruit Basket is the creme de la creme in distinguished gift-giving. Imagine everything you see in The Cheer Leader Good Cheer Fruit Basket, plus Vermont cheddar cheese and extra sharp cheddar cheese along with Table Water Crackers. These thin, extra-crispy English biscuits are baked a golden brown to lend subtle support to these delicious Vermont cheddar cheeses. Neither flavor dominates, but compliments one another to present you with a light, refreshing and nutritious snack. 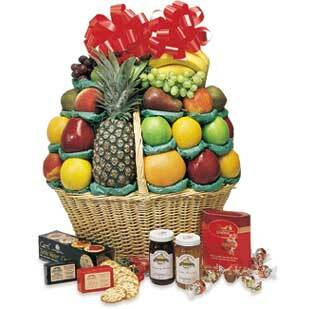 The Big Hurrah Gourmet Fruit Basket is the perfect gift for a large family or office group. When sending your thoughts or your thanks this one says it all. Save $20 for the Holidays!